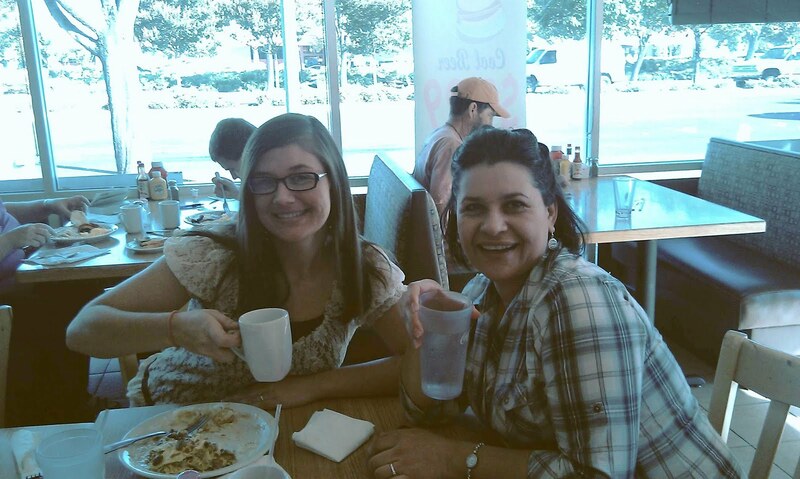 On a bright Concord morning the Chavez Center team decided to grab breakfast together after hearing one staff member give rave reviews of a local restaurant. We all just HAD to see for ourselves! I am not a morning person, so the idea of putting all that extra effort to rise and shine extra early sounded daunting. “This had better be worthwhile,” I thought. Well…It definitely was. I arrived at the 1800 Café, not sure where I was going until I spotted the eye catching signs from across the road. I turned into a tight parking area and once I entered the restaurant I got a whiff of fresh brewing coffee as a waitress with menus in hand welcomed me into a very aesthetically pleasing dining area. As a stager by hobby, environment is as important to me as customer service. Both were off to a great start! My boss was already seated and doing what he does best… working while the waitress attentively refilled water glasses and offered some of that fresh brewed morning goodness. The coffee was robust, fragrant and bold, a perfect cup. As the rest of our team started to arrive, the owner came out to greet us and welcome us to her restaurant, or should I say her friendly neighborhood diner. Mae was so warm and engaging as she filled us in on the breakfast specials. More coffee and iced water as our orders were taken and placed before we knew it. Our food came out in a timely fashion, on large warm plates. The bacon was crisp to perfection, the eggs just right, the potatoes golden brown and biscuits and gravy seemed straight out of the South. Everyone stopped talking and dug in to the tasty meal before us. We wiped our plates clean of the delicious comfort food as the coffee continued pouring. What a satisfying dining experience. Once the staff retreated back to our center, I sat and chatted with Miss Mae and I learned she is a formerly trained traditional ballet dancer and actress from China! She came to this country hoping to continue her career, but after a fruitless job search she decided to go to a culinary school and hone her natural skills to become a chef. Mae became anxious to feed her creative soul and was itching to get her newest dream started. Mae envisioned a neighborhood diner that served the freshest produce, home cooked meals that would tickle the fancy of children and adults alike. It would serve American cuisine with style and healthy choices. After convincing her husband, they agreed to start “1800 Café” the only American style diner on the Monument! Mae prides herself, her staff and her restaurant on making you feel welcomed, at home, and comfortable with their personal service. At 1800 Café, you find a place where “everybody is a friend!” This had to be true, as I noticed all of the patrons coming in greeting each other and shouting a warm hello to Mae -- from young construction types to casually dressed business types and cheery seniors as well. They all seemed to know her and she impressively greeted each of the by name! Mae has hosted many business breakfasts with the Concord Police Department as well as participating in the Non-Profit “Meals on Wheels” project. 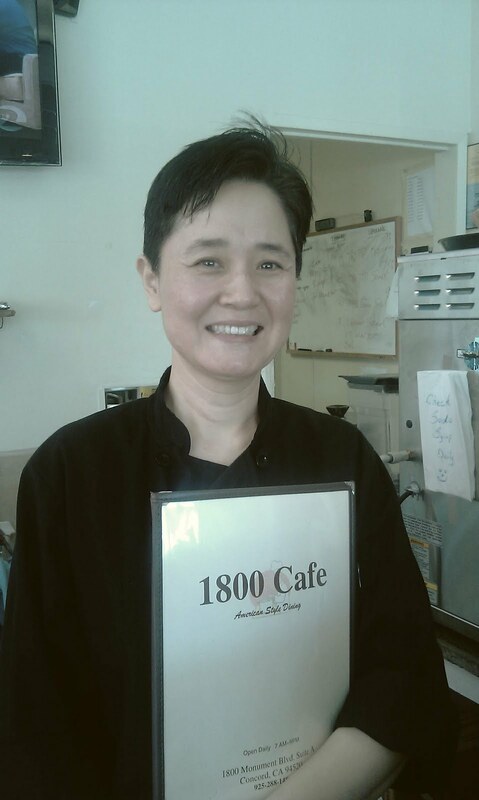 “1800” offers daily specials for Breakfast and Lunch. $5.00 certificates for all 1st time clients! The amazing dining experience makes me want to go back to visit this “friendly neighborhood diner!” But don’t just take it from me; here’s what other people are saying about 1800 Café! Gee...who wrote this fun and light piece? Very entertaining! I am going to visit 1800 very soon! Sounds like a great lil' spot!! After reading this, I am interested in going to 1800's restaurant but there was no address given, not sure how to find this great place. 1800 Cafe is at 1800 Monument Blvd, Concord, CA. So easy to remember! Please visit and say hi to Mae for us! Michael Chavez Center for Economic Opportunity 2010. Simple theme. Powered by Blogger.